I'm about halfway through making the blocks for the baby quilt I'm working on. There are 25 blocks in the quilt, and I have 12 finished and three more almost finished. 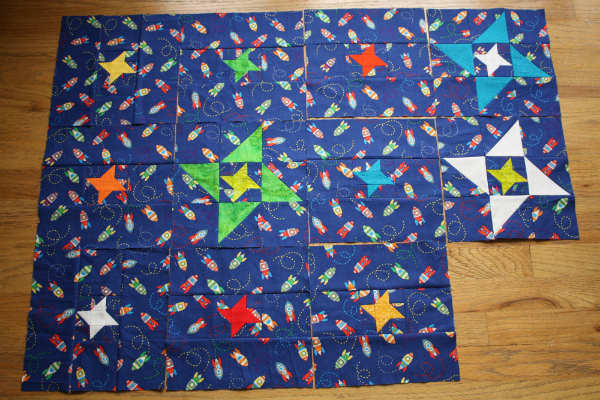 The double friendship star blocks will go all the way around the quilt, surrounding the small friendship stars. I'm calling this design "Friendship Galaxy" and the pattern is almost ready to go out to my pattern testers. The pattern will have several size variations, including a couple of mini quilt options. The baby quilt finishes at 45" square. I shared the test blocks I made here and I'm amazed at how different these blocks look with different fabrics! I don't usually sew with large scale prints. I find them hard to work with because they tend to overpower other fabrics and make it harder to distinguish the piecing. However, these Connecting Threads rockets were just too cute to resist, especially since my friends know they are having a boy. That being said, I have made one block where the small friendship star seemed to disappear. Close-up like this the block doesn't look too bad, but move any farther away and the star pretty much vanishes. Not exactly the effect I was going for! How lovely. Lucky almost new baby. I love the look of your quilt! 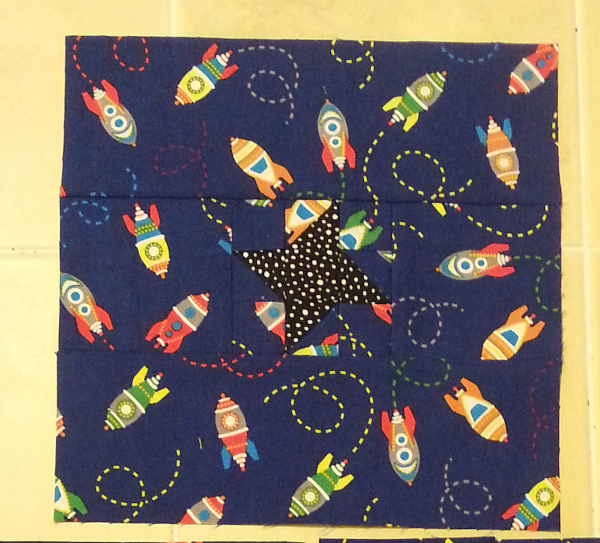 Those double star blocks are really cute and so is that rocket fabric. This is going to be such an adorable quilt! The blocks are looking great. The rocket fabric was a good choice. Fun pattern. Those rocket ships are perfect for a baby boy, even if you do have to be selective about the fabrics you use for the stars. This is darling! I love the stars with the rocket fabric.